I just returned from the Southwest Theoretical Chemistry Conference held at Texas A&M University. My thanks again to Steven Wheeler for the invitation to speak at the meeting and for putting together a very fine program and conference. where cX is the coefficient for the amount of DFT exchange, cC the amount of DFT correlation, cC and cSthe amount of opposite- and same-spin MP2, and s6 the amount of dispersion. They name this procedure DSD-DFT for Dispersion corrected, Spin-component scaled Double hybrid DFT. In their second paper on this subject, they propose the use of the PBEP86 functional for the DFT components.2 Benchmarking against a variety of standard databases, including kinetic data, thermodynamic data, along with inorganic and weakly interacting systems, this method delivers the lowest mean error among a small set of functionals. Kozuch reported at the conference on a number of other combinations and should have a publication soon suggesting an even better method. Importantly, these DSD-DFT computations can be run with most major quantum codes including Orca, Molpro, Q-Chem and Gaussian (with a series of IOP specifications). While double hybrid methods don’t have quite the performance capabilities of regular DFT, density fitting procedures offer the possibility of a significant reduction in computational time. These DSD-DFT methods are certainly worthy of fuller explorations. 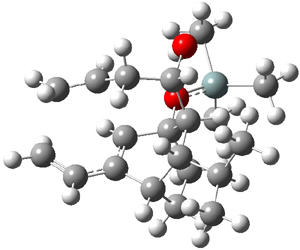 Corranulene 1 is a bowl-shaped aromatic compound. It inverts through a planar transition state with a barrier of at 11.5 kcal mol-1. What changes would be found if one per-phenylated corranulene, making2? Scott1 has prepared 2a-c by arylating corranulene using phenylboroxin and palladium acetate and repeating this arylation four times. Amazing to me is that the yield of 2c is 54%! The BMK/cc-pVDZ optimized structure of 2a is shown in Figure 1. One can readily see that the bowl is nearly flat (click on the image to activate Jmol; the x-ray structure of 2b has the bowl depth of only 0.248 Å, compared to a depth of 0.87 Å in 1. Interestingly, 2 inverts through a chiral TS (shown in Figure 1) so that inversion does not create the enantiomer! The computed barrier height is only 2.5 kcal mol-1. Figure 1. 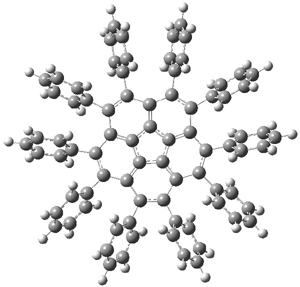 BMK/cc-pVDZ optimized structures of 2a and the bowl inversion transition state 2aTS. The flatter bowl results in longer bonds and wider angles about the rim of 2 than in 1. As one might expect, 2a is very strained: the BMK/cc-pVDZ estimation is that 2 is 53 kcal mol-1 more strained than 1, using the homodesmotic Reaction 1. In total, this is a real nice study of using strain to alter shape. The inability of common density functionals to correctly account for dispersion interactions has been addressed in a number of ways, but the most popular method is to add an empirical dispersion correction to the DFT energy . In this paper, Wilson and co-workers propose an empirical correction for nondynamic correlation that operates in a superficially similar way. If one defines nondynamic correlation as the significant contribution of several electronic configurations to the total energy of a system, it can be seen that this type of correlation becomes important for a number of chemically relevant situations, including the breaking of covalent bonds. Some of the methods typically used to recover nondynamic correlation include CASSCF and MRCI, with the common theme that they quickly become expensive in terms of computational cost, and that a degree of expertise is required in the choice of which orbitals and electrons to include in the active space of nondynamic correlation. The method proposed attempts to bypass these difficulties by carrying out a standard DFT calculation, then adding a correction for nondynamic correlation (with an empirical scale factor) via a CASCI calculation including a small set of orbitals in the active space. 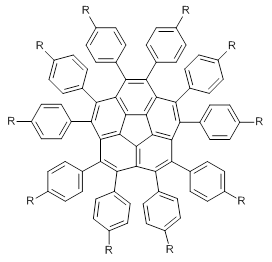 The authors suggest that this choice of orbitals can be automated, producing a computationally efficient black-box method. The initial results indicate that the method performs well for the torsion of ethylene and automerization of cyclobutadiene, yet when investigating barrier heights it seems that the best results are produced when only the transition state is empirically corrected. The results presented suggest that the method is worthy of further investigation, and I for one would be very interested to see if how it performs for spin-state splittings of transition metal complexes . See S. Grimme, J. Antony, S. Ehrlich, and H. Krieg J. Chem. Phys. 2010, 132, 154104 and references therein. As I discussed in a previous highlight, work by Ryde and co-workers suggest that one of the main obstacles to predicting accurate protein-ligand binding constants using continuum solvation models is the non-polar contributions to the change solvation energy. I was therefore intrigued when ResearchGate alerted me to a new publication co-authored by Nathan Baker on a variational approach to non-polar solvation. In this approach the solute-solvent boundary surface is varied to minimize the non-polar solvation energy. The non-polar solvation energy is a function of the area and volume of the boundary surface and the solute-solvent van der Waals interactions. The current implementation of the method contains three adjustable parameters: the surface tension and hydrodynamic pressure of the solvent and the well-depth of the Lennard-Jones potential describing the solute-solvent interaction. These parameters were obtained by fitting to experimental solvation energies of 11 alkanes, with an RMSD of 0.12 kcal/mol. These parameters were then used to predict the solvation energy of 19 new alkanes, with a resulting RMSD of 0.31 kcal/mol. The solvation energies of the 11 alkanes used for calibration are shown to be significantly more accurate than those obtained by explicit solvation. It will be very interesting to see whether this approach will lead to significantly better protein-ligand binding energies, but several issues will have to be addressed first: How will the be necessary parameters be obtained? Is the approach efficient enough to handle protein-sized systems? Does the variationally determined solute-solvent surface lead to good polar solvation energies? It will be interesting to find out. The intramolecular Diels-Alder reaction of 1 occurs slowly, but quantitatively, at room temperature.1This is unusual as most Diels-Alder cyclizations require heating to typically 200 °C. For example, the related cyclization of 2 requires heating to 170 °C.2 What is the cause for this proximity-induced reaction? 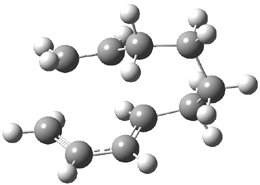 Houk and Baran address this question using a computational approach.3 The Diels-Alder reaction of 2and a simplified analogue of 1, namely 3, were computed at CPCM/M06-2x/6-311+G(d,p)//B3LYP/6-31G(d). The optimized transition states for the reaction of 2 and 3 are shown in Figure 1. The free energy of activation of 3 is 5.4 kcal mol-1 lower in energy than the free energy of activation of 2. This is consistent with the much faster reaction of 1 than 2 observed in the experiment. Figure 1. B3LYP/6-31G(d) for the transition states of Reactions 2 and 3. Partitioning 3 into fragments allows Houk and Baran to apply the distortion model. They find that the rigid diene in 3 (and thereby 1) accelerates the reaction relative to the more flexible diene of 2. Further, strain relief in going from 3 (and thereby 1) to TS3 (and thereby to TS of reaction 1) and the formation of an intramolecular hydrogen bond leads to the lower activation energy of 3, and therefore of 1. (1) Maimone, T. J.; Voica, A.-F.; Baran, P. S. "A Concise Approach to Vinigrol," Angew. Chem. Int. Ed.2008, 47, 3054-3056, DOI: 10.1002/anie.200800167. (2) Diedrich, M. K.; Klärner, F.-G.; Beno, B. R.; Houk, K. N.; Senderowitz, H.; Still, W. C. "Experimental Determination of the Activation Parameters and Stereoselectivities of the Intramolecular Diels−Alder Reactions of 1,3,8-Nonatriene, 1,3,9-Decatriene, and 1,3,10-Undecatriene and Transition State Modeling with the Monte Carlo-Jumping Between Wells/Molecular Dynamics Method," J. Am. Chem. Soc.1997, 119, 10255-10259, DOI: 10.1021/ja9643331. (3) Krenske, E. H.; Perry, E. W.; Jerome, S. V.; Maimone, T. J.; Baran, P. S.; Houk, K. N. "Why a Proximity-Induced Diels–Alder Reaction Is So Fast," Org. Lett. 2012, 14, 3016-3019, DOI: 10.1021/ol301083q.